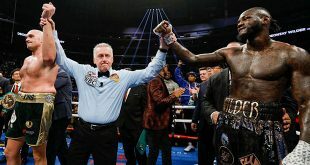 Vernon Forrest won a battle of former welterweight champions last night at the Emerald Queen Casino in Tacoma, Washington by comprehensively outboxing the determined but outgunned Carlos Baldomir over twelve rounds to annex the vacant WBC Light Middleweight title. The much shorter Baldomir, 43-11-6 (13), pressed the action for the course of the bout but simply could not match the speed and accuracy of his towering foe. Forrest employed superb footwork to keep Baldomir at bay and put his reach advantage to good use by countering the Argentine brawler with bracing shots that swept the early rounds. When Baldomir did manage to get inside, much of his plans to work over his opponent were nullified by Forrest's hard shots and savvy experience. By the middle rounds, Forrest was delivering a masterclass, outlanding Baldomir many times over but the sturdy South American was wearing down his fleet footed rival with constant pressure. By the seventh, Baldomir was starting to have success with his left hooks but couldn't ever pin Forrest down as the American managed to avoid sustained punishment. Forrest lost a point in the ninth for low blows and by the eleventh, Baldomir's tactics paid off as he finally had tired Forrest to the point where the rangy boxer was forced to trade in the trenches. But things didn't go Baldomir's way as Forrest had enough left in the tank to beat his fellow combatant to the punch and generally swept the last two rounds on skills alone. 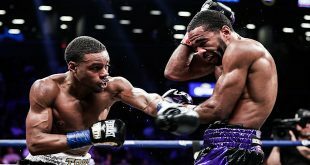 After twelve rounds, Forrest was declared the winner by unanimous decisions, winning the vacant WBC Light Middle title by scores of 118-109 (twice) and 116-111. Forrest improves to 39-2 (28) while Baldomir drops to 43-11-6 (13) and is reportedly contemplating retirement. 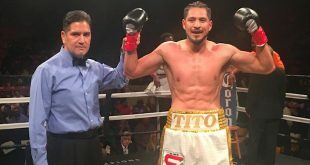 On the undercard, veteran Mexican featherweight Hector Velazquez, 48-11-2 (33), upset previously undefeated Mario Santiago, 18-1 (13), of Puerto Rico when Santiago couldn't continue due to cuts in the ninth round.